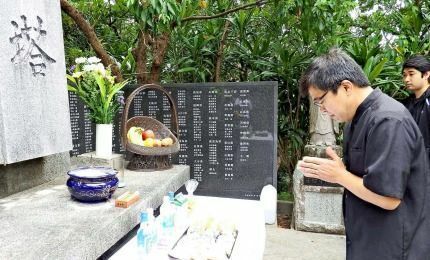 Mayor Satoru Miyazato joins his hands in prayer at the Heiwa-no-To peace memorial in Zamami Village on March 26. The villagers pledged permanent peace and vowed never to repeat the misery of war again. U.S. troops landed in Zamami Village on March 26, 72 years ago, and then Okinawa’s ground battle began. Kosei Miyazato, 80, who survived by hiding in a mountain during the wartime, while his family members died because of food shortages. “Peace in the present day is built on the sacrifice of precious lives. I want the world to be a peaceful place forever,” he said. On the day, people offered prayers freely because an official memorial service was not held. The memorial service sponsored by the village is held once every five years and will be held again in 2020.